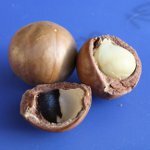 Macadamia nuts (or simply macadamias) are the seeds of the trees that are the members of the genus Macadamia. This genus is indigenous to Australia. It includes four species of trees, but only three of them are of commercial importance and only two can be eaten raw. Compared to cashews, almonds and other common edible seeds, macadamias are low in protein and high in fat. They contain about 22% of palmitoleic acid which is an omega-7 monounsaturated fatty acid. Macadamias also contain vitamins B6, C and E, calcium, iron, magnesium, phosphorus, zinc, potassium, sodium, selenium, niacin, thiamine, and riboflavin. Edible macadamia nuts are widely used in cooking. They can be consumed by themselves, either raw or roasted, or used as an ingredient in numerous dishes. Macadamias are often added to pastry and fruit salads. Macadamia oil is used for its flavor in cakes and as salad dressing. To celebrate the National Macadamia Nut Day, indulge yourself with salted or chocolate covered macadamia nuts. You can also bake a bath of macadamia nut cookies or muffins to treat your family and friends.